It's been a while since I've posted anything on the blog and I feel really bad about it. I've just not been able to find my cooking / baking mojo. See, we've had a long, hot summer; really long and really hot. I'm more of a winter person than a summer so I'm all ready for winter now. Unfortunately for us, we haven't had functional aircon for about four weeks now. So you can see why I haven't really been too active on here. I've had to figure out ways to deal with the insane heat levels that heat wave after heat wave brings to Sydney this year. I was glad to have tried out smoothie bowls recently. They were my saving grace. Healthy, full of flavor and their amazing 'cool you down from the inside out' quality made them a regular occurrence in my kitchen. The first one I tried was this Mango Smoothie Bowl and this blueberry version was really delicious too. I had some blueberries that I should have finished sooner, but I didn't want to waste them so they went right in the bowl for some color. If you love blueberries, this treat is a must try if you are looking for a healthy summer cooler. A few ingredients and a minute in the blender and a bowl is all you need to whip up this bowl of deliciousness, so I do hope you try it out. 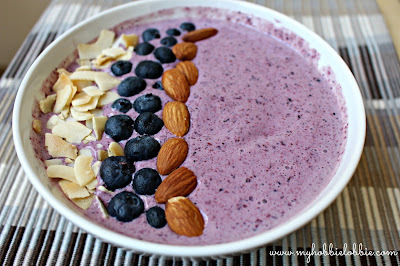 Place the banana, blueberries, milk and yogurt in a blender and blitz on slow at first. Scrape down the sides and blitz till you are left with a soft serve sort of consistency. Pour this mix into a bowl. Top with some sweetened coconut chips, fresh blueberries and almonds.